Born in 1848 in Aberdeen, the eldest child of a bookseller who was also a Deacon at the Blackfriars Street Congregational Church, Forsyth was educated at Aberdeen Grammar School and Aberdeen University, graduating MA with first-class honours in classical literature in 1869. After a year each as a private tutor, and then as an Assistant in the Department of Humanities at King’s College, Aberdeen, he studied in Göttingen and then started theological studies in 1872 at Hackney Theological College, Hampstead, but he did not complete the course, leaving in 1874. He was nevertheless ordained Minister at the Congregational Church in Shipley, Yorkshire, in 1876. His subsequent appointments a Congregational Minister were in Hackney (1880–85), Cheetham Hill Manchester (1885–8), Clarendon Park, Leicester (1888–94), and Emmanuel Church, Cambridge (1894–1901). . In 1901 he became Principal of Hackney Theological College, Hampstead, and stayed there to his death in the College in 1921. 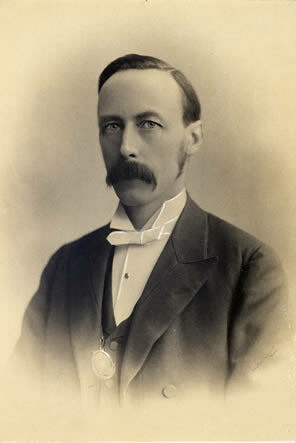 In 1905 Forsyth was elected chairman of the Congregational Union of England and Wales, and in 1911 he was appointed Dean of the Faculty of Theology at London University, while Aberdeen University had awarded him an honorary DD in 1895. Forsyth came to be regarded as the greatest Congregational theologian of his day. His numerous publications included devotional works for young people and a highly regarded Religion in Recent Art (1889), based on his lectures on Pre-Raphaelite paintings and on Richard Wagner’s Parsifal. Biography: John Huxtable Oxford New Dictionary of National Biography; H. Escott, P. T. Forsyth and the cure of souls: an appraisement and anthology of his practical writings (1970); W. L. Bradley, P. T. Forsyth: the man and his work (1952); T. Hart, (editor). Justice the true and only mercy: essays on the life and theology of Peter Taylor Forsyth (1995).